In 1993, Piper Kerman, a recent graduate of Smith College, made a reckless decision that would alter the course of her life: she accompanied her then-girlfriend, “an impossibly cool” older woman named Nora, who earned her unending stack of cash through drug smuggling, on a handful of lengthy trips. While Nora met up with her “connections” in Europe and Asia, Kerman roamed the streets and hit the beaches. But, after carrying a suitcase of cash accross the Atlantic, Kerman realized she was in over her head and she escaped to San Francisco to piece her life back together. Five years later, she was happily living in New York City with her then-boyfriend (and now husband, SMITH founder Larry Smith). Her period of criminal activity was short, non-violent—and behind her. Or so Kerman thought. Then in May 1998, two Customs agents arrived at her door. Years of legal delays later, she was sentenced to 15 months in a federal prison, 13 months with good behavior. After serving time in three facilities—including a trip on Con-Air— she was released in March 2005. 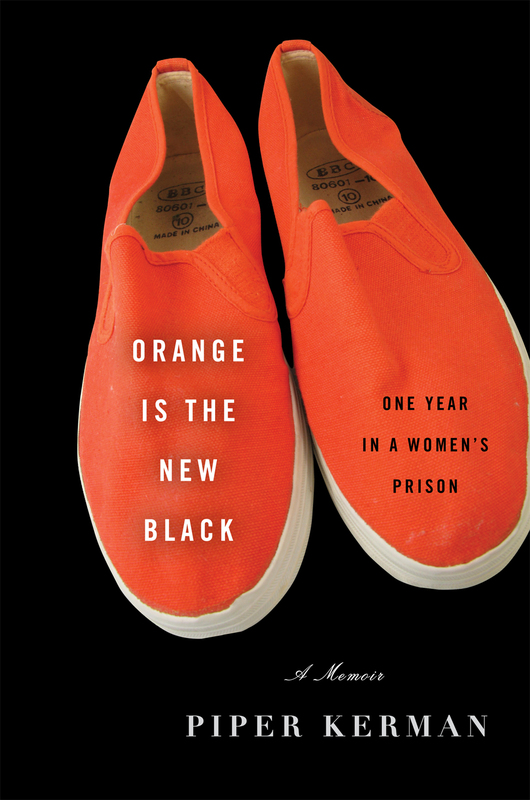 Orange is the New Black: My Year in a Women’s Prison is Kerman’s poignant and powerful memoir of those months. It’s fascinating to follow Kerman as she navigates the endless lists of rules, petty prison guards, repetitive jobs for pennies an hour (used to buy soap or a radio at the commissary), and that all-important mail call that make up life in the correctional facility in Danbury, CT. But it’s her rendering of her fellow prisoners—their surprise birthday parties with homemade cards and microwave cheesecake, the ways they bring hope and humor to the inside, and the makeshift families they create—that allows Orange to transcend the prison genre and become a story about the remarkable capacity for strength and resilience, that of Kerman and the women she met in prison. I spoke with Kerman over the phone from her home in Brooklyn, about her decision to focus on her time behind bars, what emotional blank spot is at the bottom of almost every crime, and why more than 7 million Americans can directly relate to her book. 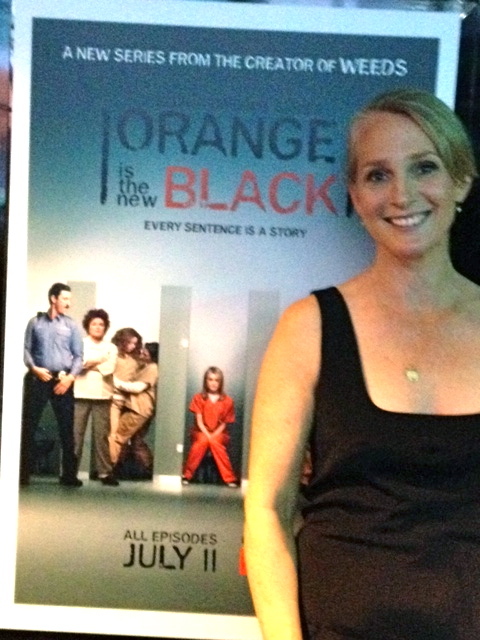 Piper at the premier of the Netflix series adapted from the book. When did you first start writing about your experience in prison? Piper Kerman: I’ve never been a daily diary person, but when I was in prison, I would occasionally write in a journal. And I wrote hundreds of letters. Then, shortly after I came home, I sat down and started writing some of the standalone narratives that are within in the book—like what was that first day like, or about my neighbor Vanessa, who’d been a man and was now a woman. All of those things ultimately went into the book. How did you move from writing those pieces to deciding to try a cohesive narrative—a whole book? Even before I sat down to write, as soon as I got home, people wanted to hear—in great detail—about the experience. There was a clear appetite for insight into this hidden world, which was really encouraging. I think people are fascinated by prison. And the very dramatic fact of transgression and punishment is engrossing, regardless of whether it’s men or women. My own experience was, in many ways, dramatically different from the popular conception and prevailing narrative about prison: who’s there, why they’re there, and what life there is like. When I came home, people would ask me, “Did you get beaten up every day?” There’s an expectation of violence. There’s definitely violence in prison, but it wasn’t a central part of my own experience. I just felt like there’s a much more complete and complex picture to be presented about who’s in the prison, why they’re there, and what happens. Do you mean that your experience was dramatically different than popular conceptions of prison because you were in a minimum-security facility, or because you’re a middle-class white woman with a much more privileged background than most of the women you were incarcerated with? Neither. Those things are true, but I think the popular image of prison, Oz and Cops, is very narrow—and intended to justify the strengths of the prison system and its out-of-control growth. If everyone in prison is an uncontrollable and irredeemably violent person, then it’s totally justified to have a massive and massively expensive prison system because, you know, public safety at any cost. But if in fact everyone in prison is not irredeemably violent, if their lives have meaning and value, then suddenly you really call into question whether our government is doing the right thing. It’s important for people who have been prisoners to have a voice, and to say in a more authentic way what life is really like. Otherwise, someone else is telling our story. You didn’t keep a daily journal at Danbury. How else did you reconstruct your time there? I wrote and received many, many letters. A lot of my friends saved my letters, and sent me copies. In my office here I have these giant binders. One of primary documents: letters I wrote, paperwork from the prison, things I received from other prisoners, like notes and birthday cards. In another binder, I put together the letters I received, which helped me understand my relationship to the outside world. The first draft I wrote was literally a month by month—every chapter was a month. That was really helpful and instructive in terms of really cataloging the experience. I think it was a little painful to read. My editor, in one of her notes in that first draft, was like, “Here I think you’re trying to capture the incredible tedium…” That rubric was shelved after that first draft. You’ve worked in the communications and media arena, but you hadn’t written for publication before. Were you worried about that at all? When I finished the first draft, I thought, Well, I wrote a book! I don’t necessarily know if it’s a good book, but it’s a book! Then there were many subsequent drafts to make it a better book. But there were definitely times, especially in the thick of it, where I thought, How am I going to do this? But I had a great support system and a wonderful editor. You just have to put your head down and do your best. You can’t get involved in a downward spiral of self-doubt. For me, Julie Grau, the editor who I was ultimately lucky enough to work with, was very challenging, right from the beginning and said, “Your ability to capture detail and paint a vivid picture is very strong, you need to work on connecting what you’re describing to your own emotional life and to see yourself as a participant and not an observer.” That was the most challenging thing, and the thing I had to work on the most. What were your perceived pros and cons before you launched into the project? I think the biggest con seemed like the loss of privacy, and I’m actually a private person. I talked to my family quite seriously to make sure that I would have their blessing. It’s a huge level of self-exposure. Memoirs are often about difficult things in a person’s life. In my situation, my story starts with about the stupidest, most immoral thing I’ve ever done, one with terrible consequences. It’s a high level of self-exposure, but that’s true for anyone who chooses to write about their own experience in a nonfiction format. You spend only a bit of time on what happened before your conviction, the decisions you made that landed you there. What was your process of working with that material—explaining your period of criminal activity to readers? Every human being makes mistakes and does things they’re not proud of. They can be everyday, or they can be catastrophic. And the unfortunate truth of being human is that we all have moments of indifference to other people’s suffering. To me, that’s the central thing that allows crime to happen: indifference to other people’s suffering. If you’re stealing from someone, if you’re hurting them physically, if you’re selling them a product that you know will hurt them—the thing that allows a person to do that is that they somehow convince themselves that that’s not relevant to them. We all do things that we’re not proud of, even though they might not have as terrible consequences. That’s something that anyone can understand. So I thought it was really important, especially in those early chapters, to both help the reader maybe understand how one makes really bad decisions, but also to take responsibility. And I hope that it’s really clear that I do take responsibility for my actions. It’s clear how awful it is to spend any time in a federal prison, especially when you discuss the power dynamics between the guards and the prisoners. But I was surprised by the ways in which it seemed livable: friendships with fellow prisoners, and the daily and weekly rituals that mark how you slog through. Prison’s pretty horrible. First of all, I have to re-emphasize—I had a very short sentence in relation to that of many of the women that I was serving time with. And I went into it—especially after almost six years of waiting—thinking, One year is one year, and you can survive anything for one year. First and foremost I walked in the prison gates with that mentality. But the way that I did my time was by focusing on what positive things I could find, either in myself or other people, and that is reflected in the book. I didn’t focus on the people I really didn’t like. I didn’t focus on feeling bad for myself. And when you start talking to people who are doing so much more time than you, and it seems like the only reason is the color of their skin and that they’re from a poor neighborhood or family, it’s pretty damn hard to feel bad for yourself. It does definitely unsettle me when folks say, “Oh, it doesn’t sound so bad.” It’s awful. Prison is a horrible thing. If you have to go to prison for one year, you’re just unbelievably grateful for the fact that you’re out. And I had an easy road home in comparison to most people who return home from prison. But the focus on the positive that the book offers is really about finding that value in humanity and warmth in a setting where we’re constantly told there’s none to be found—people are irredeemable, terrible people. And that’s not the case. The reader certainly comes away with a sense of the waste within the system—the fact that the U.S. spends a ton of money to incarcerate non-violent offenders, often for low-level drug charges. And we get a sense of the waste within prison itself, the lack of rehabilitative services. But you don’t rail against the Drug War or the prison system; you weave it in throughout the narrative. The reader is definitely able to draw her own conclusions from that. Right now, with the economy in chaos and state governments in chaos, it’s $60 billion a year in taxpayer dollars that we can’t afford economically. But it’s also not something we can afford socially; it’s devastating to communities that are already vulnerable. And it’s not one we can afford morally, because of that warehousing aspect. I think there’s this expectation that confinement alone will create the incentive and the means for an individual to make a change in their life. But it doesn’t. The women who are serving time with you are such a huge part of the book. Did you have any contact with them while writing this? I changed names, but the vast majority of people in the book I’ve had no contact with whatsoever since I got home. I had two years of probation, and when you’re on probation, you’re forbidden to have contact with people who have a criminal record. What about anyone who’s been released? Very recently, I’ve heard from a few people who I knew, and they’ve expressed excitement. I don’t know if everyone who reads it who lived in Danbury will be excited or not, but I hope so. It’s really rare for prisoners to have an opportunity to tell their own story. Almost all the personal narratives out there are by men, especially full-length books. There are a lot of anthologies from women’s writing from prison, but there’s not that much out there. I really hope that more people get the opportunity to tell their story, because my story is so specific and narrow. It’s a sprawling prison system—almost 2.5 million Americans in federal prisons, state prisons, county and city jails. Seven million Americans are either in prison, on probation or on parole, and then all of their families. That’s one of the reasons I wanted to tell the story. I think my own story is relevant to that of millions of Americans, even though there’s no question that middle-class white women are far from the majority of the prison system. Still, I think we only benefit from gaining a complete understanding: prison is a huge government entity that affects millions of Americans, and if the people are most affected don’t have a voice, that’s really questionable. The book’s been getting a lot of buzz, including a blurb by Dave Eggers, who wrote, “Don’t let the irreverent title mislead: This is a serious and bighearted book.” Why did you choose that title? The title is obviously a play on the classic orange jumpsuit that prisoners wear (which also takes on a personal meaning based on a letter a friend sent me, something I recount in the book). But it also refers to the fact that women are the fastest-growing segment of the prison population in this country. Most of those rising prisoner numbers are women who are non-violent drug offenders. Your previous Six-Word Memoir was “In and out of hot water.” What is it now? I kind of feel that it’ll always be that! That memoir probably would’ve been true on a smaller scale before all of this. That’s the nature of life: you get yourself into hot water, and then you manage to get yourself out. Whitney Joiner is a Marfa, TX-based writer whose work has appeared in The New York Times, Time, Marie Claire, and Salon.com. READ excerpts of Orange is the New Black in The New York Times and Marie Claire. WATCH the trailer for the Netflix original series based on the book. Despite what she has gone through, the author is objective and maintains a positive mentality. In short a Ballad. I adore Piper and enjoy her Verb. I want to meet like to read more about. 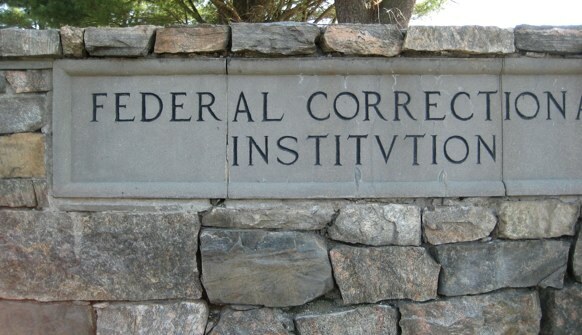 I worked as a corrections officer in Wa. St., for a very short time. I had to laugh at what Piper wrote. It was so true! There were all levels of custody at the prison, so I was able to work in every level but SHU. State prisons for the most part are easier time than federal, although there are very few decent prisons in our country. When I worked at WCCW (Washington Corrections Center for Women) the warden was very modern and progressive, meaning jobs, overnite stays for husbands, dog program, writing books or other material in braille (special machine) community colleges inside the walls, correspondence 4yr colleges who were teamed up with the facility, a floral department available to the public, ran by the women there, etc.. I also worked at a pre-release house for federal prisoners. What a different in the kind of places they were from. I vividly remember so many clients coming in who told me they were half starved while serving there time, out of meaness or lack of budget, who knows? I cooked sunday breakfast at the house, first time for me on the big grill. It was quite comical at first, I didn’t know alot about how to cook everything just right, esp Hashbrowns!. So there were usually 3 to 5 jailhouse cooks coaching me and sometimes they would argue the best way to do things. I have been a parole officer in Texas for 17 years. All states are basically the same, and Piper hit it.. I thought Piper’s book, is one of the greatest books I have ever read, and I am a voracious reader, I read everthing, (except for fiction) and I have bought this book for other people as presents, since I enjoyed it so much, so imagine how thrilled I was to read in Entertainment Weekly, that they may make a movie about her! I wonder who they will cast, she does look a lot like Gwyneth Paltrow, who is an excellent actress, but I know that I will watch it, whomever they cast, the book is one of the best books I have EVER read!